- Florida American Bulldog Rescue - ADOPTIONS - Rescue Me! Sweet senior who loves people but prefers to be the only dog. Molly's owners moved and could not take her and her housemates with them. Sweet girl! 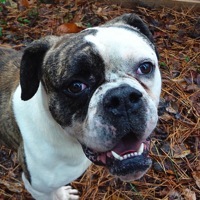 Cowboy is an awesome, about 1 year old, American Bulldog. He is sweet, energetic, smart as a tack, house-trained.